The lunar and Martian surfaces are covered with loose soil, and the wheels of rovers can get stuck on such surfaces. To avoid the problem, it is necessary to conduct thorough investigations into the contact and traction mechanics between the wheels and the soil. To this end, we conduct various experiments using wheeled rovers in a sandbox covered with loose soil. In the experiments, the slippage and sinkage of wheels with various geometries are measured. Based on these experimental observations, analysis and modelling of the motion behavior of wheels ensued. 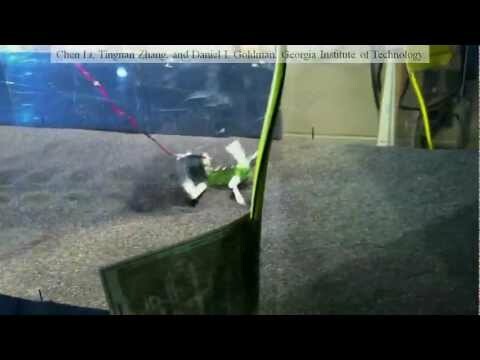 The experiments in this video evaluate the effect of leg shape on the robot's dynamic behavior on soft sand. Several types of leg shapes have been tested, e.g., from linear shapes to arcs, with varying curvatures. This video records a demonstration of the long-range rover mission on the surface of Mars. The Mars rover, the test bed Rocky 7, performs several demonstrations including 3-D terrain mapping using the panoramic camera, telescience over the internet, an autonomous mobility test, and soil sampling. This demonstration was among the preliminary tests for the Mars Pathfinder mission executed in 1997. 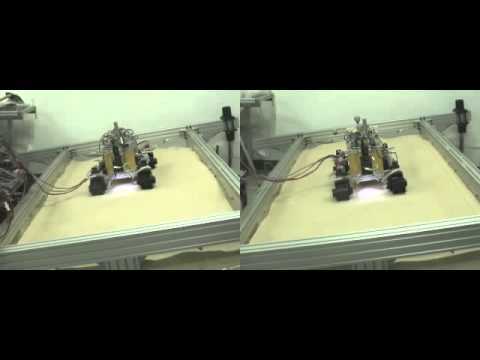 This video shows a feedback control for planetary rovers. It calculates both steering and driving maneuvers that can compensate for wheel slips and also enable the rover to successfully traverse a sandy slope. The performance was confirmed in slope traversal experiments using a four-wheeled rover test bed. In this split video clip, no slip control is performed on the left, and slip-compensation-feedback control is conducted on the right. The rover's motion is detected by the visual odometry system using a telecentric camera. 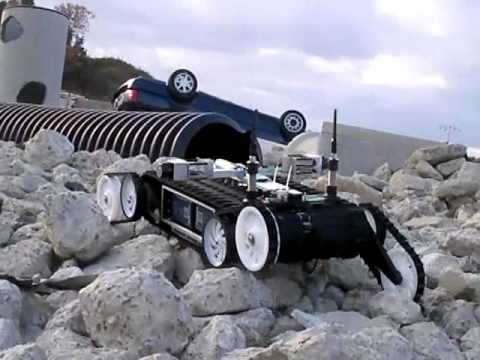 NIST (National Institute of Standards and Technology) developed a standard test field for evaluation of all-terrain mobile robots, called Disaster City in Texas, U.S.A. The field includes steps, stairs, steep slopes, and random step fields (unfixed wooden blocks), which simulates a disaster environment. 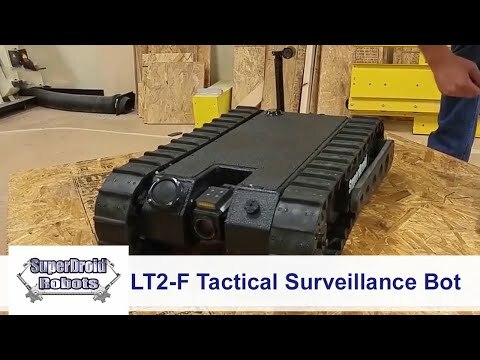 This video-clip shows an evaluation test of the tracked vehicle, called LT-F, produced by SuperDroidRobots in 2011 in the Disaster City. All tests had to be performed remotely by the vehicle for 10 successful iterations each to qualify. 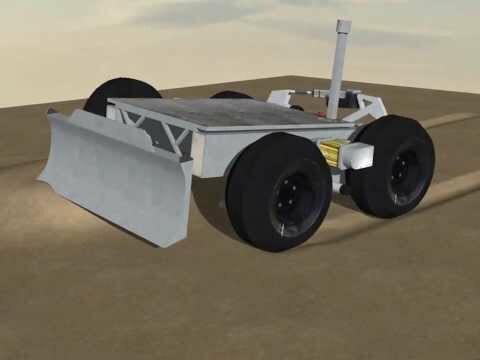 Field Robotics Group, Tohoku University, developed an autonomous controller for the tracked vehicle (Kenaf) to generate terrain-reflective motions of the sub-tracks. Terrain information is obtained using laser range sensors that are located on both sides of the Kenaf. The videoclip shows the basic function of the controller in a simple environment. Field robotics group (Tohoku University) developed an autonomous controller for the tracked vehicle (Quince) to generate terrain-reflective motions by the sub-tracks. Terrain information is obtained using laser range sensors that are located on both sides of the Quince. Using this system, operators only have to specify a direction for the robot, following which the robot traverses rough terrain using autonomous sub-track motions.